One of the most successful texts ever published on its subject, the new Seventh Edition focuses on the insights and ideas that drive the field and supports student learning. Three exciting features—a new pedagogical program based on the “testing effect,” a comprehensive, author-created instructor’s guide, and ZAPS Cognition Labs—deliver a dynamic, interactive introduction to cognitive psychology today. Based on thoroughly documented research concerning the “testing effect,” Reisberg has interwoven NEW Test Yourself questions throughout each chapter with the aim of strengthening student memory retention. NEW chapter-ending Think About It activities encourage critical thinking about the concepts, theories, and research covered in the chapter. 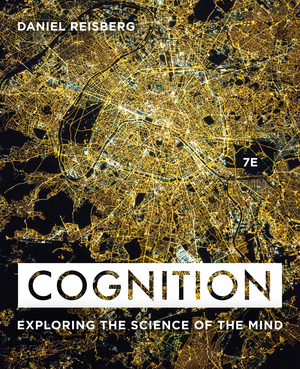 NEWCognition Outside the Lab applications highlight how cognitive psychology is connected to both student learning and everyday life. Additional essays on education and the law show students how cognitive psychology is relevant to study skills and the legal system. Each online lab has five parts: 1) a brief introduction to a concept from the text; 2) an experiment or experience in which the student generates data based on her responses; 3) analysis of the data generated by the individual student and peers; 4) examination of the theory behind the concept; and 5) a learning check that includes questions assessing student comprehension. Rigorously current, the Seventh Edition includes nearly 300 new research citations since 2014. With a focus on the research that has shaped the field and new discoveries in modern cognitive psychology, Cognition exposes students to the research that cognitive psychologists are conducting today. Reisberg’s Interactive Instructor’s Guide (IIG) includes demonstrations, chapter-specific YouTube-style clips (selected and annotated by the author), expert teaching tips, and author-written essays that highlight applications for each chapter topic in the law and education. Instructor-only notes for ZAPS Cognition Labs are also included in this IIG’s searchable and sortable collection of resources.